Dr. Cobanli is the founder of OMC Design Studios and Jury Coordinator of A’ Design Award and Competition. Onur Müştak Çobanlı holds a Ph.D. degree from Faculty of Design, Politecnico di Milano, Milan, Italy where he is a research fellow. 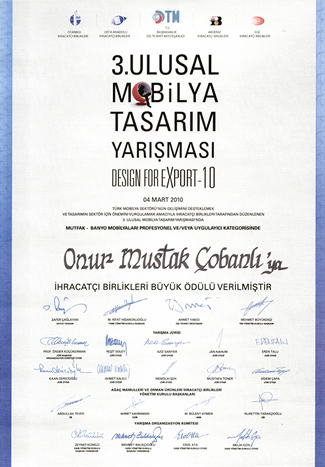 Onur Müştak Çobanlı furthermore holds a Master of Science degree in Furniture Design, Faculty of Design, Politecnico di Milano, Milan, Italy and Bachelor of Science degree in Economics, Faculty of Social Sciences and Administration, Bilkent University, Ankara, Turkey. His scientific research and study covers topics in design competitions in the contexts of; collaborative innovation, branding for businesses, out-of-the box innovation, as a government subsidy & as a policy to incubate design, interaction between designers, bridging companies and designers, making design «measurable» for companies by means of ranking, self-assessment for designers through design competitions, creating a basis for evaluating design, evaluating the ability of a person to use and understand design-language, creating a standardized test for design, a social communication network to bring like-minded people, design competitions as platforms to promote designers and countries, competitions for education of design at workshops, to promote design and create awareness for good design practices and principles. Dr. Cobanli also actively practices design by creating artifacts that reflect his personal style, his works have been featured in hundreds of design magazines worldwide. Download European CV of Onur Mustak Cobanli. Thesis: "Design Competitions: New Value Propositions"
• Research Fellow, Faculty of Design, Politecnico di Milano, Milan, Italy. Academic Years, 2014-2018. Research on the value of design, innovation through design and design policy. • Workshop Professor : Bologna University, Bologna (Italy), Design Del Prodotto Industriale - Industrial Design Course. Academic Years, 2015 - 2016. • October 2013–February 2014 Teaching Assistant : Laboratorio di Metaprogetto 2013-2014 Politecnico di Milano, Milan (Italy). Assisted Laboratorio di Metaprogetto class as Teaching Assistant. • October 2012–February 2013 Teaching Assistant: Laboratorio Sviluppo Prodotto 2012-2013 Politecnico di Milano, Milan (Italy) Assisted Laboratorio Sviluppo Prodotto class as Teaching Assistant. • October 2011–February 2012 Teaching Assistant: Laboratorio di Metaprogetto 2011-2012 Politecnico di Milano, Milan (Italy) Assisted Laboratorio di Metaprogetto class as Teaching Assistant. • October 2010–February 2011 Teaching Assistant: Laboratorio Sviluppo Prodotto 2010-2011 Politecnico di Milano, Milan (Italy) Assisted Laboratorio Sviluppo Prodotto class as Teaching Assistant. • Coordinator, A' Design Award & Competition, 2009-Present. Coordinating jury, public relation efforts and co-curate the exhibitions. • Book: A' Design Award, Winner Designs 2016 - 2017, Vol 18-P (Product Design). ISBN: 978-88-97977-46-9 (508 pages), Designer Press, 2016. Editor: Onur Mustak Cobanli, DesignerPress, Milan / Italy. • Book: A' Design Award, Winner Designs 2016 - 2017, Vol 19-C (Communication Design). ISBN: 978-88-97977-48-3 (390 pages), Designer Press, 2016. Editor: Onur Mustak Cobanli, DesignerPress, Milan / Italy. • Book: A' Design Award, Winner Designs 2016 - 2017, Vol 20-S (Spatial Design). ISBN: 978-88-97977-44-5 (423 pages), Designer Press, 2016. Editor: Onur Mustak Cobanli, DesignerPress, Milan / Italy. • Book: A' Design Award, Winner Designs 2016 - 2017, Vol 21-I (Interior Design). ISBN: 978-88-97977-19-3 (564 pages), Designer Press, 2016. Editor: Onur Mustak Cobanli, DesignerPress, Milan / Italy. • Book: A' Design Award, Winner Designs 2015 - 2016, Vol 14-P (Product Design). ISBN: 978-88-97977-11-7 (430 pages), Designer Press, 2015. Editor: Onur Mustak Cobanli, DesignerPress, Milan / Italy. • Book: A' Design Award, Winner Designs 2015 - 2016, Vol 15-S (Spatial Design). ISBN: 978-88-97977-16-2 (541 pages), Designer Press, 2015. Editor: Onur Mustak Cobanli, DesignerPress, Milan / Italy. • Book: A' Design Award, Winner Designs 2015 - 2016, Vol 16-C (Communication Design). ISBN: 978-88-97977-17-9 (254 pages), Designer Press, 2015. Editor: Onur Mustak Cobanli, DesignerPress, Milan / Italy. • Book: A' Design Award, Winner Designs 2014 - 2015, Vol 10-S (Spatial Design). ISBN: 978-88-97977-10-0 (316 pages), Designer Press, 2014. Editor: Onur Mustak Cobanli, DesignerPress, Milan / Italy. • Book: A' Design Award, Winner Designs 2014 - 2015, Vol 12-P (Product Design). ISBN: 978-88-97977-33-9 (331 pages), Designer Press, 2014. Editor: Onur Mustak Cobanli, DesignerPress, Milan / Italy. • Book: A' Design Award, Winner Designs 2014 - 2015, Vol 11-C (Communication Design). ISBN: 978-88-97977-14-8 (185 pages), Designer Press, 2014. Editor: Onur Mustak Cobanli, DesignerPress, Milan / Italy. • Book: A' Design Award, Winner Designs 2013 - 2014 (Spatial Design), ISBN 978-88-97977-07-0, Designer Press, 2013. Editor: Onur Mustak Cobanli, DesignerPress, Milan / Italy. • Book: A' Design Award, Winner Designs 2013 - 2014 (Communication Design), ISBN 978-88-97977-12-4, Designer Press, 2013. Editor: Onur Mustak Cobanli, DesignerPress, Milan / Italy. • Book: A' Design Award, Winner Designs 2013 - 2014 (Product Design), ISBN 978-88-97977-32-2, Designer Press, 2013. Editor: Onur Mustak Cobanli, DesignerPress, Milan / Italy. • Book: A' Design Award, Winner Designs 2012 - 2013, ISBN 978-88-97977-08-7, Designer Press, 2013. Editor: Onur Mustak Cobanli, DesignerPress, Milan / Italy. • Book: A' Design Award, Winner Designs 2011 - 2012, ISBN 978-88-97977-03-2, Designer Press, 2012.Editor: Onur Mustak Cobanli, DesignerPress, Milan / Italy. • Book: I Design Awards Yearbook 2012, ISBN 978-88-97977-06-3, Designer Press, 2012. Editors: Onur Mustak Cobanli & Swapna Chakraborthy, DesignerPress, Milan / Italy. • Book (Chapter/Partial): LIGHT WORKS – EXPERIMENTAL LIGHT 2011,ISBN 978-88- 38761191 Editor: Francesco Murano, Con saggi di Jacqueline Ceresoli, Gabriella D’Argenio e Onur Mustak Cobanli Edizioni Maggioli 2012 Milan / Italy. • Book (Sections/Partial): "RED, ROSSO, ROJO, Tectum", 2009, ISBN 978-88-7906-767-6 (Pages: 68-69,74-75,72-73), Tectum Publishers, Editor: Franco Busti, Antwerp / Belgium. • ADI (Associazione per il Disegno Industriale), Member, 2009 - present. • ICSID (International Council of Societies of Industrial Design), Corporate Member, 2011 - present. • ICOGRADA (International Council of Communication Design), Corporate Member, 2012 - present. • IFI (International Federation of Interior Architects/Designers), Corporate Member, 2013 - present. •Jingdezhen Ceramic Fair Conference, "Study of ceramic furniture, focusing on modernization of classical Chinese ceramics through collaborative innovation". Jingdezhen, China, 18-22 October, 2010. • Product Design Days'12, "Marketing and branding product designs – the Italian way. ",Chennai, India, 22-23 November, 2012. • Ph.D. Week, Politecnico di Milano, Milan, Italy. 2013. • Designing Pleasurable Products and Interfaces, Design Conference, Milan, Italy. 2011. • Design Principles and Practices, Design Conference, Rome, Italy. 2012. • Generative Design Conference, Milan, Italy. 2009. • Brandmarker, Marketing for Individuals, Boğaziçi University, İstanbul, Turkey. 2008.